Researchers who just concluded a brainstorming session weekend, lamented inadequate funding as a major limitation to research findings that will help to manage the effects of climate change to human health The researchers, who met during the 4th edition of annual scientific conference of the National Institute of Medical Research (NIMR), Yaba, Lagos, noted that climate change effects are obvious today in the environment, but for inadequate researches on them. Opening the conference, Director General of the Institute, Prof Innocent Ujah observed that the theme of this year’s annual conference: ‘Impact of Climate Change on Health: Identifying the Research Gaps,’ is timely. According to him, the confab could not have come at a better time, given the recent series of calamities resulting from the effect of climate change on man and the environment in particular, and the ominous predictions of such occurrences for the future. The recent sad occurrence in the Philippines on Friday, November 8, 2013, the super typhoon Haiyan, which according to reports has claimed over 10,000 lives, destroyed homes and communication facilities, is sad reminder of some of the effects of climate change. Prof Ujah said that the recent fire incident in Australia, the numerous Tsunamis, hurricanes, typhoons, tornados in the U.S, radioactive / chemical discharges from the nuclear plant turbines in Japan, and the tropical cyclones are also some of the effects of global warming on the environment and health. Also, in Nigeria, reports indicate that in the last week, some 22 school children with some of their teachers could have died from inhaling fumes of chemicals released from a nearby company but for prompt and effective emergency health intervention, he said. He lamented the dangerous consequences of climate change, noting that it has become an issue of global concern. His words: “Climate change endangers human health, affecting all sectors of society, both domestically and globally.” Prof. Ujah listed the environmental consequences to include; sea-level rise, changes in precipitation resulting in flooding and drought, heat waves, more intense hurricanes and storms, and degraded air quality. Giving the breakdown, Prof. Ujah said that Africa contributes 2.5 per cent of the global cumulative carbon dioxide (CO 2) emission from fossil fuel, insisting that the major emitters are the fasting growing economies and developed countries. This is even as he added that the major green house gases are CO2, mostly from fossil fuel and land use change, methane and nitrous oxide. He also said that the United Nations Framework Convention on Climate Change (UNFCCC) which approved the Kyoto protocol to help reduce the greenhouse gas emissions has the ultimate objective of stabilizing greenhouse gas concentrations in the atmosphere at a level that would prevent dangerous anthropogenic interference with the climate system. Health impacts of extreme weather events hinge on the vulnerabilities and recovery capacities of the natural environment and the local population, the DG said, adding; “Changes in prevalence and spread of infectious diseases are some of the most widely cited potential effects of climate change which could have significant consequences for human health as well as economic and societal impacts.” He bemoaned the effects of climate change in Africa, saying that the continent is one of those with the highest risk. “Africa is one of the most vulnerable continents to climate change, with its situation further worsened by poverty, poor economic development and low adaptive capacity,” Ujah said. He also noted that the framework for public health adaption to climate change is to provide scientific and coordinated response to climate change adaptation needs of countries, especially in the Africa region that is saddled with burden of poverty and frequent famines that have exacerbated its ability to adapt and prevent the effects of climate change. Regrettably however, such evidence is scanty and especially deficient in understanding of the potential impacts of climate change on the health of the continent, he said. The DG lamented that recurrent food shortage in the horn of Africa has resulted in malnutrition as a result of formers’ inability to cope with increasingly unpredictable weather due to their over-dependence on rain-fed agriculture. The rest he said are; environmental variations causing health-related complications include change in diet and lifestyles which have been shown to have led to rise in incidence of cancer, diabetes and cardiovascular diseases even among rural communities. 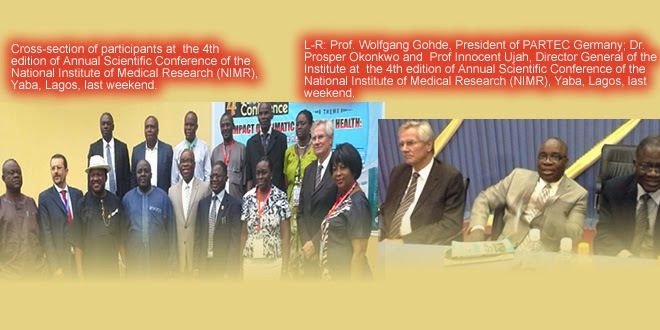 He, therefore, said that the conference was used as a platform to brainstorm on the strategies to bridge health research gaps in view of the few recognized and little regional research in the African region. Also, the deliberations of the conference is helpful in reviewing poor and unreliable data and inadequate disease surveillance and poor health data which should include the generation of local knowledge on climate change and human health that cuts across geographical regions building codes, warning systems, disasters policies, evacuation plans and relief efforts, Ujah said. Other benefits, he said are effective coordination of the various government agencies and NGOs involved in the planning and response to natural disasters. According to him, the Interagency Working Group on Climate Change and Health (IWGCCH) recommendation on relevant research needs include research on mitigation and adaptation strategies, insisting that this requires basic and applied science, and covers technological innovations and capacities, public health infrastructure, communication and education. Ujah, also advocated that these should be clearly stated in national health research agenda, noting that the use of scientific research results for applications and decision making should be adopted. He also said that an enabling environment must be created for researchers to be able to design research protocols, adding that the institute’s E-Library under construction will certainly provide the appropriate learning and research environment for improved health research productivity. In view of this, he said that the governing board of NIMR have adopted a plan of action which is aimed at strengthening the capacity of the institute in critical areas of its mandate. According to him, the plan includes; strengthening NIMR’s financial resource base to reduce dependence on statutory allocation, expanding its research areas through the provision of the necessary physical infrastructure and opening up the institute to the entire health sector with a view to maintaining its status as the premier research institute in Nigeria. Others are; exploiting government policy on public private partnership, attracting local funding in order to complement the efforts of international partners and donor agencies and the review of the enabling law establishing the institute. This story was published in Newswatch Times on November 21, 2013.